On Wednesday, October 27, 2015, El Super Grocery Workers and hundreds of supporters staged a nonviolent civil disobedience causing the store to shut down for hours, in Paramount, California. Southern California United Food and Commercial Workers (UFCW) Union locals 324, 770, 1428 and 1167 represent approximately 600 El Super workers employed at seven locations. The unions and our El Super members called a boycott of El Super markets on December 20, 2014, in protest of El Super’s refusal to provide our members with Respect and a Fair Contract. El Super employs low-wage and predominantly Latino workers. The workers at the Union stores were were covered under a contract with El Super that expired on September 27, 2013. For over a year the Union and the worker bargaining team have sought to bargain to improve the working conditions. In 2014, El Super stepped up its union busting efforts and workers were compelled to vote, in a US Government supervised election, to re-certify their union. The workers voted on December 12 – by a more than 3-1 – in favor or retaining the UFCW. El Super workers’ mandate followed in spite of an aggressive “Vote No” campaign by the company that included captive audience meetings conducted by El Super CEO Carlos A. Smith. After the recertification vote, the union promptly sent a letter to the company asking for them to return to the bargaining table. El Super ignored this request. 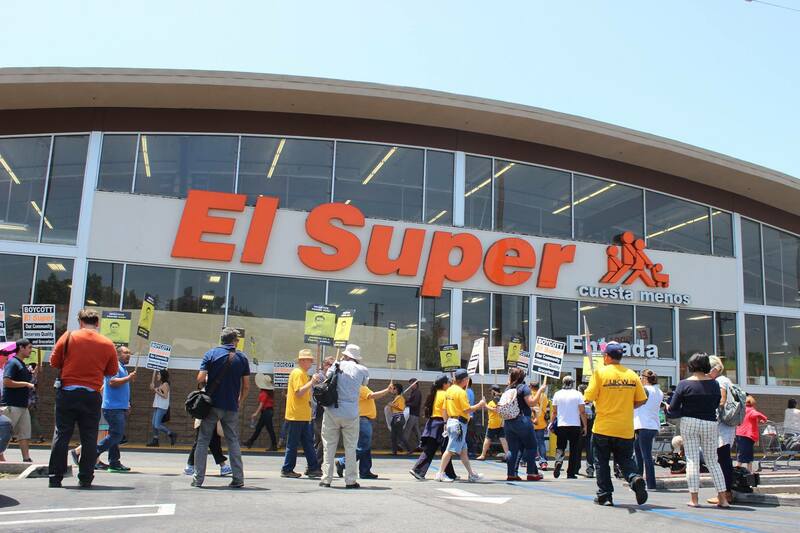 El Super’s inaction, and its steadfast refusal to address the workers’ priorities such as more guaranteed hours, adequate sick leave, and fair pay, led to our call for a consumer boycott of El Super markets on December 20. The California Labor Federation and the Los Angeles County Federation of Labor have sanctioned the boycott with their full support. Two days later, four community-based organizations anchoring the Coalition for a Better El Super – East LA Community Corp., Pueblo y Salud, Strategic Concepts in Organizing and Policy Education, and Strategic Action for a Just Economy – publicly endorsed the workers’ boycott call. The Coalition members demanded an investigation into El Super’s business practices by County health authorities. Since February 2014, inspections at Los Angeles, San Bernardino and Orange County El Super stores have documented 941 violations of environmental health regulations, including 74 deemed “Major” or “Critical” violations. The boycott will continue until El Super workers achieve their core goal of winning respect and a fair contract. The outstanding issues include adequate paid sick leave, seniority rights, guaranteed 40-hour work weeks, and fair pay.